Balzer + Bray, 9780062456700, 40pp. 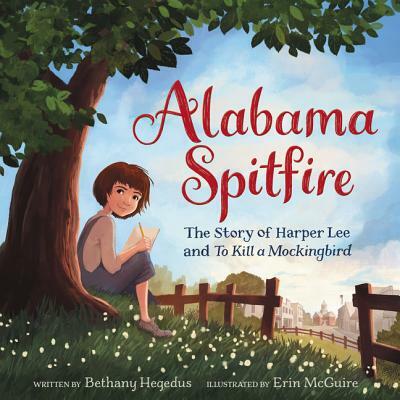 The inspiring true story of Harper Lee, the girl who grew up to write To Kill a Mockingbird, from Bethany Hegedus and Erin McGuire. Perfect for fans of The Right Word and I Dissent. Nelle Harper Lee grew up in the rocky red soil of Monroeville, Alabama. From the get-go she was a spitfire. Unlike most girls at that time and place, Nelle preferred overalls to dresses and climbing trees to tea parties. Nelle loved to watch her daddy try cases in the courtroom. And she and her best friend, Tru, devoured books and wrote stories of their own. More than anything Nelle loved words. This love eventually took her all the way to New York City, where she dreamed of becoming a writer. Any chance she had, Nelle sat at her typewriter, writing, revising, and chasing her dream. Nelle wouldn’t give up—not until she discovered the right story, the one she was born to tell. Finally, that story came to her, and Nelle, inspired by her childhood, penned To Kill a Mockingbird. A groundbreaking book about small-town injustice that has sold over forty million copies, Nelle’s novel resonated with readers the world over, who, through reading, learned what it was like to climb into someone else’s skin and walk around in it. Bethany Hegedus is the award-winning author of Alabama Spitfire: The Story of Harper Lee and To Kill a Mockingbird, Truth with a Capital T, and Between Us Baxters and coauthor with Arun Gandhi of Grandfather Gandhi. She owns the Writing Barn, a writing workshop and retreat center in Austin, Texas. Bethany, a former educator, teaches widely and speaks across the country. You can find her online at www.bethanyhegedus.com. Erin McGuire is an illustrator of picture books and middle grade novels, including Breadcrumbs by Anne Ursu, the Nancy Drew Diaries series, and Sleeping Beauty by Cynthia Rylant. When not drawing, she enjoys reading, cooking, and camping. Erin lives in Dallas, Texas, with her husband and two cats. Visit her online at www.emcguire.net.